Background The overlap between asthma and COPD is increasingly recognised. This review examines the new insights, treatment and remaining knowledge gaps for asthma–COPD overlap. Method A systematic literature review of cluster analyses of asthma and COPD was performed. Articles from 2009 to the present dealing with prevalence, morbidity and treatment of asthma–COPD overlap were identified and reviewed. Results Asthma–COPD overlap was consistently recognised in studies using a variety of different study designs and sampling. The prevalence was approximately 20% in patients with obstructive airways diseases. Asthma–COPD overlap was associated with increased morbidity and possibly an increased mortality and comorbidity. There was evidence of a heterogeneous pattern of airway inflammation that included eosinophilic (in adult asthma), neutrophilic or mixed patterns (in severe asthma and COPD). Systemic inflammation was present in asthma–COPD overlap and resembled that of COPD. Within asthma–COPD overlap, there is evidence of different subgroups, and recognition using bronchodilator responsiveness has not been successful. Guidelines generally recommend a serial approach to assessment, with treatment recommendations dominated by an asthma paradigm. Research is needed into key clinical features that impact outcome, mechanisms and treatment approaches in asthma–COPD overlap. Identifying and treating disease components by multidimensional assessment shows promise. Conclusions Asthma–COPD overlap has drawn attention to the significant heterogeneity that exists within obstructive airway diseases. It should be replaced by novel approaches that identify and manage the components of this heterogeneity, such as multidimensional assessment and treatment. Future research is needed to test these novel and personalised approaches. Since Thorax reviewed this topic in 2009,1 there have been many publications addressing the heterogeneity within asthma and COPD and the problem of the overlap between asthma and COPD. What progress has been made? What new insights have been gained? How can we treat this problem? What knowledge gaps remain? This review will address these issues (box 1). Why is asthma–COPD overlap important? Prevalence: Asthma–COPD overlap has a prevalence of approximately 20% of patients with obstructive airway disease (asthma or COPD) and 2% in the general population. This is consistent across study designs and varying definitions. Increased illness burden: Asthma–COPD overlap leads to significant health status impairment, increased exacerbations and increased hospitalisations. When asthma is not recognised, there is potential for increased adverse events and drug toxicity from long-acting β2 agonists use. There is an increased response to inhaled corticosteroids and long-acting β2 agonists in COPD patients with asthma. There is limited evidence for treatment recommendations because asthma–COPD overlap patients are excluded from randomised controlled trials. Childhood onset: There may be opportunities to prevent the development of asthma–COPD overlap by studying early-life origins. Articles from 2009 to the present dealing with prevalence, morbidity and treatment of asthma–COPD overlap were identified and reviewed. We searched MEDLINE (2009–2014) using the search terms (overlap AND asthma [MeSH Terms] OR COPD [MeSH Terms] OR (chronic obstructive pulmonary disease [MeSH Terms]) OR (chronic obstructive airway disease [MeSH Terms]). The prevalence of asthma–COPD overlap, and the impact of comorbid disease have been described in cohort and population-based studies5–9 (box 1 and figure 1). A variety of sampling methods and case definitions have been used to assess asthma–COPD overlap. The prevalence was found to be approximately 20% of participants with obstructive airway disease (figure 1) and 2% of adult population samples.8–10 Patients with coexisting asthma and COPD have an increased illness burden compared with asthma or COPD alone. They suffer greater health status impairment and more frequent acute exacerbations resulting in increased hospitalisation5–7 (box 1). Mortality may also be increased.10 Diaz-Guzman10 reported a population sample of 15 203 participants and found that 2.7% had coexisting asthma and COPD. This group had the highest risk of mortality (HR 1.45, 95% CI 1.06 to 1.98), followed by COPD alone (HR 1.28, 95% CI 1.13 to 1.45) and asthma alone (HR 1.04, 95% CI 0.85 to 1.27). 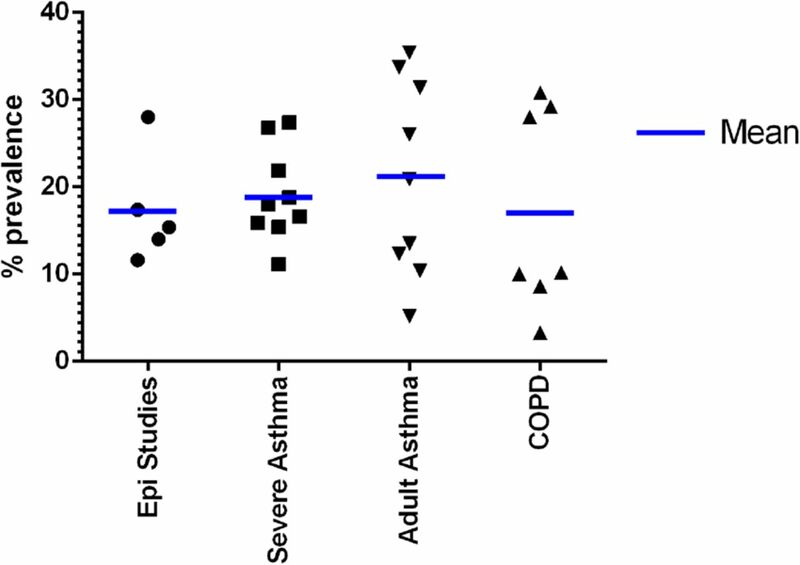 Prevalence of asthma–COPD overlap in studies of varying designs. Comorbidities are common and contribute to a significant disease burden in COPD.11 In asthma, comorbidities are generally not a recognised problem, except in severe asthma12 and asthma in the elderly.13 The comorbidity spectrum in asthma–COPD overlap is an area of increasing research interest. The Charlson Co-morbidity Index has been reported and compared with asthma and COPD alone in a number of recent studies (table 1). Some studies identify increased comorbidity in asthma–COPD overlap,5 ,8 ,14–16 whereas others do not7 ,17 (table 1). One study reported excess diabetes, stroke and arthritis in asthma–COPD overlap.8 There is a need to investigate comorbidities in asthma–COPD overlap in terms of their frequency, severity, impact on outcomes and mechanisms. Is asthma–COPD overlap a phenotype of airway disease?18 Cluster analyses of asthma and COPD can be used to answer this question.19 In asthma, a MEDLINE search was conducted up to 1 September 2014 using the terms (asthma[MeSH Terms] AND cluster, n=621 hits), and reference lists of relevant articles were assessed. Eligible articles included adult patients with asthma, used clustering statistical methodology and included post-bronchodilator FEV1 among the cluster variables (since this is the defining characteristic of COPD). The asthma–COPD overlap phenotype was identified by inclusion of ‘overlap’ or ‘airflow obstruction’ in the label of the phenotype, or in the textual description of the phenotypic characteristics. The tables of phenotype characteristics were also required to demonstrate significant differences in post-bronchodilator FEV1 in the asthma–COPD overlap phenotype. Relevant articles were identified and assessed and included 11 in severe asthma, and 12 in adult asthma. If an asthma–COPD overlap cluster was reported, it was assessed for generalisability (was it reported by other studies? ), characteristics (are they similar between studies? ), temporal stability, independent validation, prognostic relevance and association with treatment responsiveness. Asthma–COPD overlap was identified as a distinct phenotype of severe asthma in nine studies, whereas two studies failed to find it as a separate phenotype (table 2).20–29 These results establish that asthma–COPD overlap is a distinct phenotype that can be identified across different severe asthma populations. Independent validation of asthma–COPD overlap as a phenotype was confirmed in four studies,21 ,23 ,24 ,26 and two studies reported that the asthma–COPD overlap phenotype was stable over time.23 ,26 Two studies evaluated the prognostic impact of asthma–COPD overlap.23 ,26 One study found similar 1-year outcomes in asthma–COPD overlap compared with other phenotypes,26 whereas Newby et al23 observed an improvement in lung function when asthma–COPD overlap patients had systematic treatment over a 1-year period. Ortega et al27 identified that the asthma–COPD overlap sub-phenotype of severe eosinophilic asthma with frequent exacerbations had the best response to mepolizumab, with a 68% reduction in severe exacerbations. There were two studies that failed to identify asthma–COPD overlap.20 ,22 The reasons for this are unclear. Gupta et al20 conducted a cluster analysis of patients with severe asthma and related quantitative CT thorax findings. While the unsupervised cluster analysis did not identify a specific asthma–COPD overlap subgroup, the supervised a priori analysis did identify a group with severe asthma and persistent airflow limitation. Haldar et al22 performed cluster analysis on asthma groups derived from primary care and secondary care/refractory asthma. Asthma–COPD overlap was not identified as a specific phenotype in either analysis. Low-grade systemic inflammation is hypothesised as a unifying mechanism in COPD.11 ,52 Its role in asthma is less defined but is likely to be significant particularly in the presence of comorbidity and severe disease. Little is known about the role of systemic inflammation in asthma–COPD overlap. In several studies, evidence of systemic inflammation was identified in asthma–COPD overlap, and it was similar to COPD,5 ,53 ,54 with elevated IL-6, C-reactive protein, tumour necrosis factor-α, surfactant protein A and a reduction in plasma levels of soluble receptor for advanced glycation end-products. These data suggest that systemic inflammation in asthma–COPD overlap is common and that the inflammatory systemic profile resembles that of COPD. While asthma has traditionally been considered a disease associated with eosinophilic airway inflammation and COPD one of neutrophilic inflammation, it is now evident that eosinophilia, neutrophilia and a mixed inflammatory phenotype can exist in both asthma55 and in COPD.56 ,57 The pattern of airway inflammation in asthma–COPD overlap was reported in a large cross-sectional study of >4000 patients with airway disease,58 where approximately 9% of participants had asthma–COPD overlap. Their airway inflammatory profile demonstrated eosinophilic bronchitis (35%), neutrophilic bronchitis (19%) and a mixed inflammatory pattern in 10%. These data support the concept that asthma–COPD overlap is a heterogeneous inflammatory disorder of the airways. These epidemiological associations have now been supported by CT measurements of airway dimensions. Adult smokers with a history of childhood onset asthma have smaller airways than smokers without a history of childhood asthma.62 These smaller airway dimensions extended throughout the entire bronchial path that was examined (figure 2). 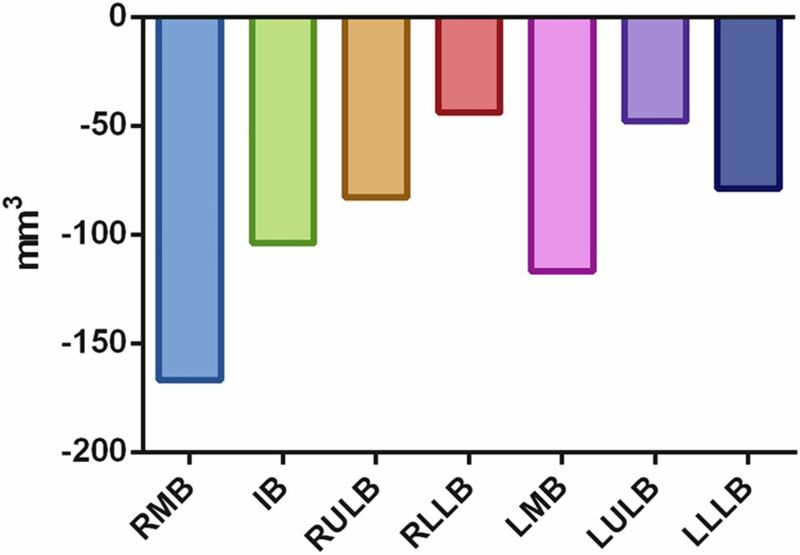 Effect of childhood asthma on airway volume loss in smokers.62 RMB, right main bronchus; IB, Intermediate bronchus; RULB, right upper lobe bronchus; RLLB, right lower lobe bronchus; LMB, left main bronchus; LULB, left upper lobe bronchus; LLLB, left lower lobe bronchus. The specific mechanisms of asthma–COPD overlap resulting from childhood asthma are not clear. Both airway inflammation and airway remodelling have been proposed. These do occur in childhood asthma66 and in adults have been linked to accelerated decline in lung function.67 However, whether they can also lead to incomplete lung growth is unclear. It is likely that there are other relevant issues that determine optimal lung growth. The role of severe childhood asthma has been evaluated in the SARP cohort30 where a cluster with ‘early-onset atopic asthma with advanced airflow limitation’ was identified. The prevalence of this cluster was 18% and children in this cluster had the highest exhaled nitric oxide values, the highest extent of healthcare use, highest daily doses of ICS, and most were receiving at least three asthma controller medications. This suggests that severe eosinophilic asthma in childhood leads to incomplete reversibility of airflow obstruction. This cluster has been replicated,68 and it was found that they had the best treatment response to ICSs and long-acting β2 agonist (LABA) therapy. Since childhood asthma is a risk factor for asthma–COPD overlap, and severe childhood asthma with airflow limitation is eosinophilic in nature, the question arises as to whether ICS use for childhood asthma can protect against overlap? This issue is not yet settled but seems unlikely based on the CAMP studies and the observations of the Dunedin cohort, where adults with the lowest lung function were using ICS.69 Addressing these issues in childhood asthma may offer opportunities for prevention of asthma–COPD overlap (box 1). It is likely that certain phenotypic features will be more useful than others. For example, in 2009, it was proposed that asthma–COPD overlap be identified using the combined physiological criteria of COPD (incompletely reversible airflow limitation, post-bronchodilator FEV1 <80% predicted and FEV1/FVC% <0.7), and of asthma (variability of airflow limitation, increased BDR). The ‘COPD’ component of this definition remains valid and useful in the settings of asthma and COPD. However, BDR has not been found to be a useful way to recognise asthma in patients with COPD. It has been found that BDR is not reproducible, is not related to other typical asthma features76, does not predict ICS responsiveness, and is not specific for the asthma–COPD phenotype.51 This means that in asthma–COPD overlap BDR is an example of phenotype mimicry since, while it is an accepted phenotypic feature of asthma, it does not usefully recognise asthma in the setting of COPD, meaning it is a phenotypic feature that mimics asthma in COPD. This has been an important advance since 2009. Asthma–COPD overlap syndrome (ACOS) research directions. ICS, inhaled corticosteroid; LABA, long-acting β2 agonist. Adapted with permission from ‘The Lancet’. Given the paucity of evidence available to guide treatment decisions in asthma–COPD overlap, it is no surprise that there are many areas of research that require investigation. 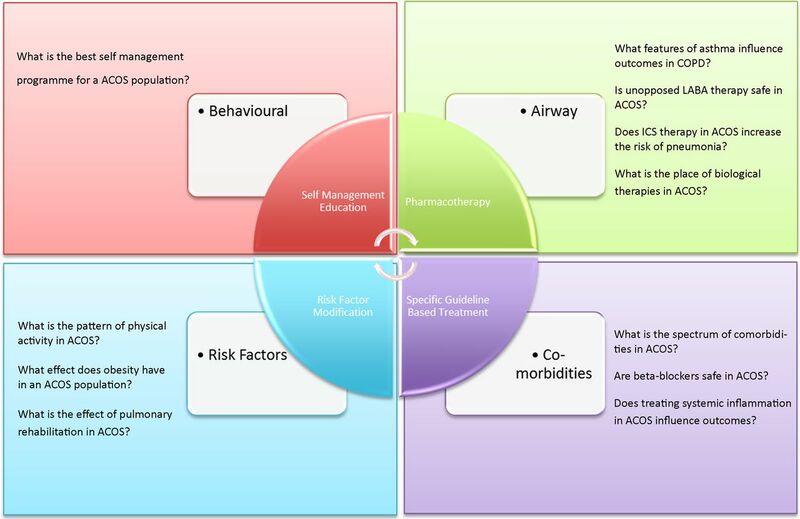 The areas of research enquiry can be considered in four domains: questions related to the airways, comorbidity, risk factors and self-management (figure 3). There is a need to improve the characterisation of asthma–COPD overlap. It is likely that a risk-based approach will be most useful, as has occurred in other diseases. For example, which features of asthma, such as BDR, eosinophilia and atopy, confer an increased risk to a patient with COPD? Alternatively, in a patient with asthma, what is the increased risk associated with coexisting incomplete reversibility of airflow limitation? Some forms of asthma–COPD overlap seem so different that combining them into a single phenotype is unlikely to be useful. For example, the phenotype of long-standing asthma with the development of incomplete reversibility seems very different to asthma in a current smoker, or COPD with eosinophilia. The treatment recommendations for managing COPD are to initiate long-acting bronchodilator therapy to control symptoms and add ICS once the FEV1 falls below 50% predicted or patients experience frequent exacerbations.3 In asthma, one would first initiate ICS and continue to step up the ICS dose and add on LABA to achieve good control. The risk profiles of ICS and LABA may be different in asthma and COPD. In COPD, ICS use can increase the risk of pneumonia. In asthma, the use of LABA without ICS, as recommended in COPD, is associated with deteriorating asthma control, increased severity and mortality. A person with asthma–COPD overlap, where the coexisting asthma is not recognised, could be treated with LABA alone. Is there is an increased risk of unopposed LABA therapy in asthma–COPD overlap? In a population-based longitudinal cohort study,82 new users of LABA and ICS/LABA were followed for a median of 2.5 years. The asthma–COPD overlap group comprised 28% of the population and had an increased relative risk of hospitalisation or death by approximately 8% when they received LABA monotherapy. These data suggest that the unopposed use of LABA in asthma–COPD overlap may be associated with increased risk compared with a COPD population without asthma. Comorbidities are common in COPD and have a significant impact on patient outcomes. The spectrum and prevalence of asthma–COPD overlap comorbidities is not well established, nor is the impact. Very little is also known about the mechanisms that link comorbidities with asthma–COPD overlap. Studies investigating comorbidities in asthma–COPD overlap will provide much needed insight. β-Blockers are effective in chronic heart disease where they reduce mortality. They are safe in COPD but underused.87 In asthma, β-blockers can induce serious bronchoconstriction. Their risk–benefit profile in patients with asthma–COPD overlap and comorbid cardiac disease is unclear. The importance of physical activity is well established in COPD,88 and patients with COPD are less active and more sedentary than their healthy aged match counterparts.89 Far less research has characterised physical activity in an asthma population. Investigating physical inactivity and sedentary behaviour characteristics, impact and treatment interventions in an asthma–COPD overlap population is an evolving area of research. In COPD, mild-to-moderate obesity has been associated with improved survival90 and reduced lung function decline.91 Conversely in asthma obesity is detrimental and associated with increased disease severity, poor symptom control and increased airway inflammation.92 The effect of obesity in asthma–COPD overlap is unknown. Pulmonary rehabilitation, a fundamental treatment recommendation for patients with symptomatic COPD, has not been rigorously evaluated in asthma–COPD overlap. One RCT demonstrated improved health status compared with usual care following an exercise programme.93 The most appropriate pulmonary rehabilitation approach in an asthma–COPD overlap population warrants further investigation. What self-management approaches work in asthma–COPD overlap? Self-management programmes for both asthma and COPD have proven effective; however, asthma self-management programmes are not directly transferrable to patients with COPD,94 and careful selection of patients with COPD is required to avoid harm.95 It is therefore reasonable to assume that patients with asthma–COPD overlap may require a different approach; this needs to be tested in an overlap population. Highlighting the overlap between asthma and COPD has increased recognition of the heterogeneity in obstructive airway diseases. Asthma–COPD overlap is consistently identified with a prevalence of around 20% of patients with asthma or COPD (box 1 and figure 1). People with features of asthma and COPD have increased morbidity, mortality and possibly more comorbidities. The underlying airway inflammatory pattern can be eosinophilic (adult asthma and childhood asthma), neutrophilic (severe asthma, COPD) or both. Whereas airway inflammation is heterogeneous, the systemic inflammation that occurs in asthma–COPD overlap resembles that of COPD. A precise and useful definition of asthma–COPD overlap has not been possible, and the condition itself appears to compromise several different sub-phenotypes. It is proposed that addressing disease components via a multidimensional approach to assessment and management of obstructive airway diseases will be useful to manage the heterogeneity of these conditions. Global Initiative for Chronic Obstructive Lung Disease (GOLD). Global Strategy for the Diagnosis, Management and Prevention of Chronic Obstructive Pulmonary Disease. 2014. Global Initiative for Asthma (GINA). Diagnosis of Diseases of Chronic Airflow Limitation: Asthma, COPD and Asthma-COPD Overlap Syndrome (ACOS): Global Strategy for Asthma Management and Prevention. 2014.
. Chronic obstructive pulmonary disease and asthma-patient characteristics and health impairment. COPD 2014;11:256–66.
. Economic burden in direct costs of concomitant chronic obstructive pulmonary disease and asthma in a Medicare Advantage population. J Manag Care Pharm 2008;14:176–85.
. Three phenotypes of obstructive lung disease in the elderly. Int J Tuberc Lung Dis 2010;14:1481–8.
. Treatment responsiveness of phenotypes of symptomatic airways obstruction in adults. J Allergy Clin Immunol. Published Online First: 4 Mar 2015. doi:10.1016/j.jaci.2015.01.013.
. Heterogeneity of bronchitis in airway diseases in tertiary care clinical practice. Can Respir J 2011;18:144–8.
. Consensus document on the overlap phenotype COPD-asthma in COPD. Arch Bronconeumol 2012;48:331–7. Committee for the Third Edition of the COPD Guidelines of The Japanese Respiratory Society. Guidelines for the Diagnosis and Treatment of COPD (Chronic Obstructive Pulmonary Disease). 3rd ed, 2010. National Asthma Council. Australian Asthma Management Handbook. 2014.
. Chronic Obstructive Pulmonary Disease: official diagnosis and treatment guidelines of the Czech Pneumological and Phthisiological Society; a novel phenotypic approach to COPD with patient-oriented care. Biomed Pap Med Fac Univ Palacky Olomouc Czech Repub 2013;157:189–201.
. Withdrawal of inhaled corticosteroids can be safe in COPD patients at low risk of exacerbation: a real-life study on the appropriateness of treatment in moderate COPD patients (OPTIMO). Respir Res 2014;15:77.
. Self management for patients with chronic obstructive pulmonary disease. Cochrane Database Syst Rev 2014;3:CD002990. Contributors PGG developed the concepts, wrote and critically reviewed the manuscript. VMM developed the concepts, wrote and critically reviewed the manuscript.